Anyways, I've searched the forum, and I found that there hasn't been any activity from the Winnipegers!!! Let us know what you have under your hood and inside your cabin! Winter is coming fast, so let's have a meet and greet before the "deep-freeze" and talk rotary, storage ideas, good/ bad dealerships, etc. Let's revive the Winnipeg rotary community and prepare for an awesome 2011! And, C'MAN Winnipeg!! Today, I saw 3 freaking 8's driving around! Are none of you on the forums?? For the Black, you seriously need some work done. PS I have a feeling that I'll be chatting to myself in this thread... Anyone out there?? Haha that was likely my grey 8. I wanted to try my snow tires so badly; now I regret getting it dirty! Nice to see 'Winnipeg' in a thread title. Ironic we don't stand out on 8club when you consider we must have more 8's per capita than Toronto, Calgary or Vancouver. I can't get thru a day without spotting several. At least in summer (chuckle). I know!! It was good to see a few brave souls with their winter tires on, pushing through our snowfalls. If it wasn't for the salt on the road, I'd also be plowing the roads with "Roxy". Rick, are you planning on driving the 8 throughout the winter? How has it been so far? Oh and, YAY I'M NOT ALONE!! I've had the car for 2 years. It's originally from Ottawa and I traded in my Jeep TJ for it. In other words, I don't know for a fact how much snow or salt she's seen. I had no intention of driving this winter, but since it included the p/o's Dunlop Graspic tires I thought I'd test it. The tires are phenomenal on ice or snow. But, this IS Winnipeg, so I quickly realized I don't have the ground clearance for 12" ruts of snow. I gave it a thorough wash last night (after your post!) and brought it downtown to completely dry out in underground parking today. Then it will be kept at home on a battery tender for the next sunny dry winter day. I have a double garage, but it's presently packed with two 83 rx7 gsl's and parts from a third. Good thing my wife is a saint, lol. as of now, there have been 207 visits to this thread. No one from wpg? That's funny; I've been on this forum for a while now and never noticed this thread until today. I've owned my '06 RX8 for about a year and a half now and am amazed at how many RX8s I've seen around town since I've owned it. I've even purposely parked next to someone else's 8 just to take photo or two like a mini-meet. :P If you see a red 8 around with the license plate "ROB D" on it, give me a flash of you high-beam. I'm from Winnipeg too and have been on this forum for a few years but this is the first time I've seen this thread. My RX8 is currently tucked away for winter, but some of you may have seen me driving around south winnipeg in the summers. Mine is a black 2004 with mazdaspeed front bumper, borla exhaust, bronze mb wheels rims, and eyelids. I can't wait till spring to get her back on the roads! For those looking for mazda and rotary meets check out the Manitoba Mazda Club or the mazda and rotary threads on Winnipeg Heights. Yeah, I've seen a number of 8's, but I don't know if any are on these forums. Yeah, this thread was tucked away and not getting too much attention. Hopefully it picks up!! Last edited by Markpoole69; 02-15-2011 at 12:30 PM. Hi Mark, Garrett, Rob! Since this IS the "Winnipeg" thread, let's talk about the joys. I was going to post a picture of the dash showing -32 C on the display, but all the 'mericans would think it was photoshopped. And I had the "pleasure" of flooding my engine again. -20 C turn it over... rum rum rum ruuuuuhhhh .... guh. And that's all she wrote. Good thing I have experience de-flooding. So yeah, I'm driving it this winter after all, and enjoying it a lot. Now that the streets are plowed. Not exactly a "Pro Tip", but when it's bloody cold outside and your engine is flooded.... which you know it is because it sounds like zero compression and you're thinking OMG I am so screwed if the engine is FUBAR... "Gunk" brand "Liquid Fire" starting fluid is great. Clean your plugs, pull the fuel pump fuse, crank a few minutes, replace fuse & then spray starter fluid into a juuust barely open airbox. Works like a charm. I have NO idea what liquid ether does to the catalytic converter, but I'll go out on a limb and say it must be better than liquid gasoline! Last edited by Rick Hayes; 04-09-2011 at 08:07 AM. I've had gas in my catalytic converter before.....my car almost caught on fire, no joke. Finally, it's starting to look like ol' Mother Nature has finally taken her pills! I mean, relax! Snow one minute; rain the next. -35 for a week, +2 for an hour, then back to -40!!! But, thanx for reminding us what wonderful ******* roads we've missed, layered under all that "White ****". Oh, I can't wait until construction season is upon us! Thanx, you frozen, unrelenting, road-breaking, flip-flopping sack of pubescent-like-hormones witch! Sooooo... I checked out my car today, all dusty in the cold, gloomy garage. Fired her up, and she purred like my ex Couldn't move her, so I let her run for about 15min, while I tinkered with her engine, listening for all the noises that get me excited every time I hear them, making sure that she was revved up and warm. Then I shut her down. So, I fire her back up. Nothing. Barely even getting the starter to spin! Hook up the Jumper cables. Nothing! Pulled battery and taking to get it looked at tomorrow! (well, in a few hours lol) I'm thinking either battery, fuse or starter. No good with electrics. But, I'll figure it out! Looking forward to an awesome cruise season with all you Winnipegers!! (And any others who wish to join). When are you all ready to unleash your beasts? Last edited by RX8Soldier; 03-25-2011 at 03:19 AM. 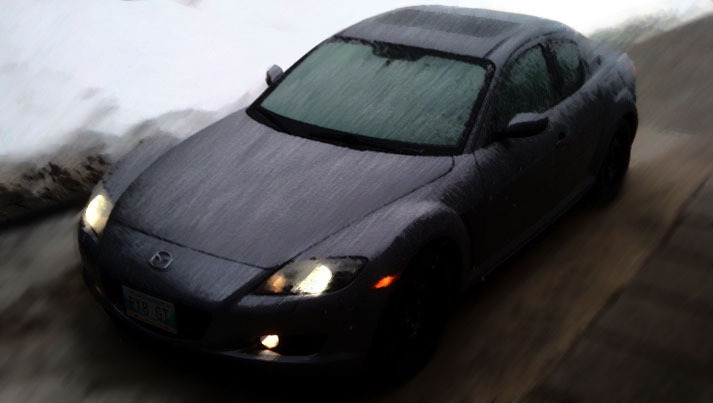 That there is another RX-8 owner, in Winnipeg, with the name Garrett? Slim to none would be my guess, but there you are. RX8 Soldier, thanks for starting this thread. For myself, I don't actually lurk here that often. I bought my 8 ('06 Special Edition) just before doing my tour in the 'Stan myself, but I find that most people here are WAY for techie than I am, so for the most part, I don't feel that I can contribute much to the conversation. While I don't actually live in Winnipeg, I am close (Portage la Prairie) and would love to get together for a group ride sometime. Right now I am driving an old Dakota, trying to get through the winter, but after nearly 5 years, I still get butterflies whenever I see my baby. Looking forward to seeing you guys on the road. Yeah, not too many Rotorheads live in the Winnipeg area (that I know of, anyways...). I've owned a couple 7's in the past, so I had some prior knowledge. I've learned so much from this site, and it helped me build my confidence to actually get messy in the engine bay! So, even though you don't contribute, at least you can learn something and get to know your baby even more! What color is she? The '06 Special Edition? You mean "Shinka"? Anyways, lets start the chit-chat! I'll try to organize a meet, unless anyone knows of one from one of the other forums? Hope to see you all out enjoying the sun!! One of things that I like most of the RX-8 is that it really isn't that common. Before I purchased it, I considered the 350 and Mustang, but both seemed to be everywhere, especially the Mustang. I doubt I'll get the nerve to do much work on the engine though. This winter I took the battery out and dropped one of the brass brackets into the engine bay. I eventually got it out, but not before a great deal of self loathing and promises to only let an expert touch her in the future. I really do baby her, and hope to be able to drive her for many many years. As for the Shinka thing, yeah, I think that it is a Shinka Special Edition, though that title seems to be used for other years more than for the 2006. The colour is called Copper Mica, and it is pretty rare on the 8, and I LOVE the alcantara/leather seats. Here is a question though, who do you guys take your cars to for servicing. I went to the Mazda dealer way out west on Portage Ave but was really unimpressed. Maybe they just had a bad couple days, but I'm certainly in no hurry to go back there. haha I'm sure you'll get over that fear. I was pretty bad and nervous when I first started tinkering with the engine. But, with a bit of reading from this forum, it actually gave me quite a bit of confidence to open the hood and get to know it more! I'm sure that we'll have a meet this year and go over the engine, because there really aren't too many shops around here that know how to troubleshoot/ repair our engines. I actually feel more comfortable doing the work myself!! I've never personally seen a 20b. I agree that they're incredible! But, it's one hell of a job!!! Two thumbs up for Gerry Gordon Mazda. I've had decades of experience dealing with them (rx7's, 626, mx3, rx8). Their parts & service people are very knowledgeable and helpful. Parts prices seem the same when you call for quotes from other dealerships. Only issue I have is the hourly labor rate. It doesn't faze me, I do all my own wrenching, but they charge about a trillion $/hour for service. AND... May is just around the corner. Despite the flooding and the rain, the streets are drying. Let's organize a meet! Last edited by Rick Hayes; 04-09-2011 at 08:08 AM. My 8 in the driveway this week... with a bit of Photoshopping. I'm definitely up for a meet! I don't plan to have mine on the road until 1 May though, so any time after that. Bad news today. My wife's friend opened a door into my 8. I'm so pissed... I think I just need to get out and go for a ride! Thanks for the advice on Gerry Gordon. Perhaps RX8Soldier can get me doing some of my own maintenance, but honestly, I'm not terribly optimistic. My brother in law just bought an old Rx-7, and he said that he got it from this idiot savant kind of guy that seems to be a rotary genius or something. I guess he lives in a house full of wankel parts and has a yard full of old rx-?'s. Says not to judge him by his cover, but I can't really say, because I haven't met him. OO000oooo V1, so sorry to hear about your door. When I find a new scratch or bug chip or road rash, I grit my teeth and remind myself: some seriously talented engineers designed this car to be driven hard and driven fast. It's a rolling piece of art, but they never intended the Rx-8 to be a trailer queen. Small consolation. It still hurts like a bugger when it happens. Quick Reply: New Winnipeg, Manitoba thread!